STORY UPDATE: The closing keynote panel with Kentucky gubernatorial candidates will stream live online on Tuesday, July 28 at 3:15 PM here. The 2015 governor’s race is set to take center stage at the Kentucky Chamber’s Business Summit as Republican Matt Bevin and Democrat Jack Conway are scheduled to speak at the event. 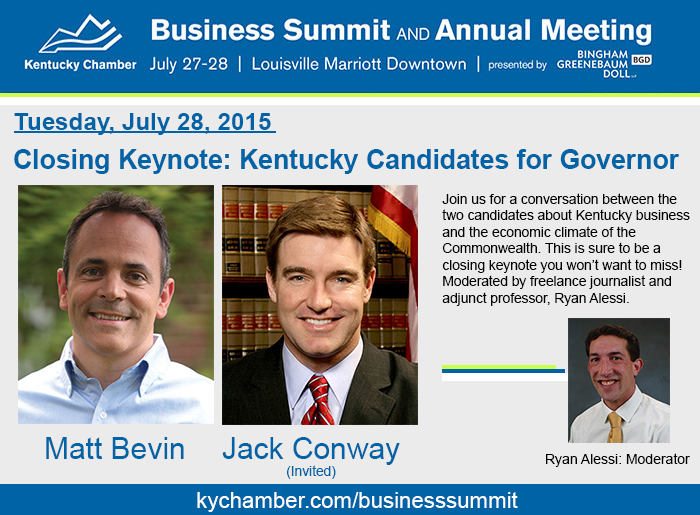 Bevin and Conway have both been invited and are expected to attend the Kentucky Chamber’s 2015 Business Summit and Annual Meeting, presented by Bingham Greenebaum Doll, on July 27. The two candidates will participate in a discussion moderated by Ryan Alessi, the former host of cn|2’s Pure Politics who is now working as a freelance journalist and adjunct professor. Now in its tenth year, the Business Summit and Annual Meeting, scheduled for July 27 and 28 at the Downtown Marriott Louisville, provides an opportunity for business leaders throughout the Commonwealth to discuss the issues related to the local, national and international economies. The Kentucky Chamber’s signature event has consistently brought renowned journalists, political analysts and speakers to the Business Summit with the intent to enhance the conversations had during the two-day think tank. Make sure to register for the Kentucky Chamber’s 2015 Business Summit and Annual Meeting. See the full agenda for this year’s event here. Conway and Bevin will speak on many issues important to the Kentucky Chamber. To see stances taken by the candidates in the primary election, check out the Kentucky Chamber’s Primary Voter’s Guide.